The handheld T-10A and T-10MA are designed for easy use to measure the quality and brightness of a light source as it lies along a surface. Lux is the illumination strength of light striking a certain location. 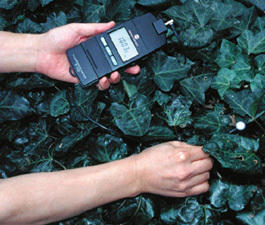 The T-10A is an illuminance meter that is used for taking lux measurements and evaluations; in other words, a lux meter. This lux meter is capable of calculating and displaying the average values of illumination on a LCD screen. Both the T-10A and T-10MA Illuminance Meters are able to provide illumination value comparisons that can be displayed as a percentage value or as a difference according to the user’s preference. Users can choose to manually enter target levels by using the keypad or via measurement. The T-10A can automatically calibrate after powering the device. The device can also measure intermittent and continuous light sources. Certain light sources may require adjustment; this device allows users to enter color correction factors for those adaptations. The range of these lux meters varies from 0.01 to 299,99lx and includes auto range switching. The T-10A measures Pulse Width Modulation (PWM) of controlled light sources. There is a removable receptor head so that an assortment of measurements can be accommodated. 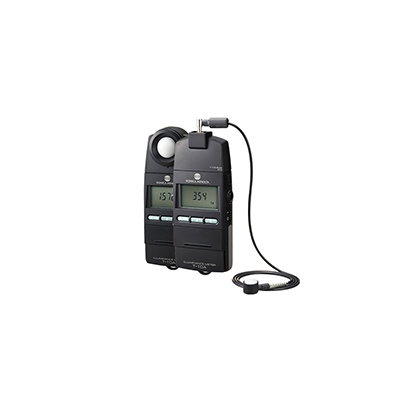 This device has the additional benefit of allowing users to connect up to 30 different receptor heads so that multi-point measurement are possible without rearranging the lux meter; a feature that is extremely convenient for movie screens. This device comes in a miniature model ideal for measurements in narrow or confined spaces. The device has been updated to USB computer connection from the former RS-232C connection. Illuminance (lx). Illuminance difference (lx). Illuminance ratio (%). Integratedilluminance (lx·h). integration time (h). average illuminance (lx). *1 Conforms to requirements for Class AA of JIS C 1609-1:2006 for all items except cosine response (f2). *2 Although measurements below 1.00 lx are possible, they may not be stable due to the effects of electrical noise. *Do not touch the cable during measurements. Doing so may result in unstable measurement values. *Secure the cable during measurements. Failure to do so may result in unstable measurement values.